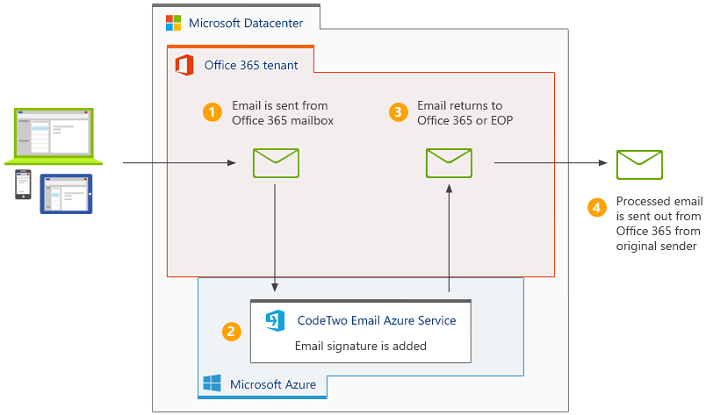 CodeTwo Email Signatures for Office 365 uses Exchange Online email connectors to integrate with Office 365 tenants of our clients and then safely reroute their email through our signature services on Azure. Since uninterrupted email flow is critical, we do our best to keep this integration the most secure and reliable on our end. One of the latest TechNet articles demonstrates the way 3rd party apps can integrate with Office 365 (where email add-on service installation is not allowed). The article uses a fictional service called ‘Contoso Signature Service’ to picture what such integration should ideally look like. Email signatures? Connectors? Does it ring a bell? That’s right! This is the exact same approach we have been using in CodeTwo Email Signatures for Office 365 since day one. The only difference is that we have automated the integration process completely on our end. Meaning, every step, from setting up the connectors, right down to assigning a required TLS certificate is done automatically by a specially designed wizard in our program. You don’t have to do any manual work to start using our product. You can, however, be sure we always follow the best practices and highest quality standards to keep your email communication safe.